Denver-born artist Jordan Casteel makes her way back home for her first major museum showing at the Denver Art Museum. On view through August 18, 2019 is Jordan Casteel: Returning the Gaze. The exhibit showcases nearly 30 paintings from the East High School graduate’s body of work from 2014-2018. With that body of work, the exhibit features Casteel’s portraits that include subject matter ranging from cityscapes and subway scenes to women and local business owners. Take a peek inside the gallery here. Returning the Gaze is included in general admission. Thanks to Scott Reiman and made possible by the Free for Kids program, general admission is free for all youth ages 18 and under. Watch below the teen-led conversation with Casteel as part of the opening of the exhibit. Currently based in Harlem, New York, the discussion includes Casteel’s upbringing in Denver and her memories in and around the Mile High City. Courtesy of the Denver Art Museum: Denver native and emerging artist, Jordan Casteel discusses art, Denver and more to coincide with her first major museum opening at the museum. Scott Reiman and the Reiman Foundation support organizations that have the potential to significantly change lives. ACE Scholarships does just that. For the past 17 years, ACE Scholarships has helped Colorado students living in underserved areas attend private schools and expand their opportunities for the future. Check out the ACE video below to see the impact that can be made when families, ACE and partners, such as Reiman, come together to invest in a student’s future. 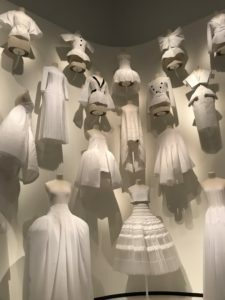 The Denver Art Museum captures the intricate process of haute couture in Dior: From Paris to the World. One of fashion’s most iconic couturiers has taken up shop at the Denver Art Museum. On view through March 17, 2019 is Dior: From Paris to the World. The exhibit observes the fashion house’s legacy and global influence over the past 70 years. The collection highlights its founder, Christian Dior’s creative genius and his transition from the art world to the fashion industry. It also showcases the creative directors who succeeded him into the 21st century. On display includes more than 200 couture dresses, along with accessories, costume jewelry, photographs, drawings, runway videos and more. Scott Reiman and the Reiman Foundation support the Denver Art Museum and exhibits like Dior: From Paris to the World that have made the DAM one of the best museum’s in the nation. Courtesy of the Denver Art Museum: Explore the world of the haute couture in Dior: From Paris to the World now on view at the Denver Art Museum through March 3, 2019. This year marks the hundredth anniversary of Big Brothers Big Sisters of Colorado mentoring programs. Since 1918, Big Brothers Big Sisters of Colorado has offered programs that match adults (Bigs) and youth (Littles) for ongoing mentoring relationships. Currently, Big Brothers Big Sisters of Colorado provides programs that are community-based, sports-centric, and/or academics-focused. Bigs and Littles build their relationships through regular meetings and participating in events and activities together. Through these programs, Littles are able to build self-confidence, improve academically, and create healthy habits. These positive results are also shown to continue into the adult lives of former Littles, demonstrating the lasting impact of Big Brothers Big Sisters mentoring. On October 18, Big Brothers Big Sisters of Colorado will be marking their centennial at the Big Night Out Gala, which will gather community leaders, philanthropists, and current Bigs and Littles. The event will honor volunteers and corporate partners as well as celebrate a century of guiding youth to a bright future. Big Brothers Big Sisters of Colorado has a special place in the heart of Scott Reiman, who spent several years volunteering as a mentor through the Big Brothers Big Sisters program. He congratulates Big Brothers Big Sisters of Colorado on 100 years of guiding youth toward a bright future.